It has long been known that individual investors do not typically fare well in their efforts at do-it-yourself investing. 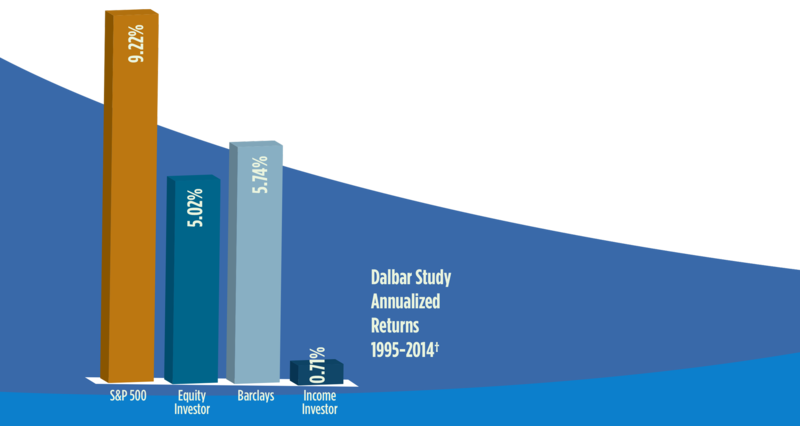 This notion has been validated by numerous studies, including one by Dalbar, Inc., which revealed the staggering margin by which the average individual investor trails the returns of the broader market. As the chart shows, the study revealed the S&P 500* returned 9.22% while equity investor’s return over that same period was a paltry 5.02%, a difference of 4.20% annually. The average fixed income investor fared no better over the same period, achieving 0.71% annual while the Barclays Aggregate Bond Index* averaged 5.74%, a difference of 5.03% annually. Emotion drives investors to buy the latest hot investment near its peak and sell the investment after riding it to the bottom on its inevitable slide downward. The “buy high, sell low” scenario is unfortunately not just an anecdote, but is very real for many individual investors. The end result is simple. Buying on greed and selling on fear might satisfy short term emotional needs, but the lack of discipline may compromise long-term objectives. Are You a Prudent Saver? Do you have the time, training and temperament to make good decisions? The vast majority of participants in a company retirement plan do not pay the needed amount of attention to their initial investment selection. Moreover, statistics show plan participants rarely revisit their choices over time as their objectives change and markets evolve. WOULD YOUR ADVISOR LET YOU MAKE THESE MISTAKES? Over the past few years many employers have enhanced their retirement plans to include a brokerage window opportunity so that plan participants have more choice and greater flexibility with their retirement investments. This option, known as the Self Directed Brokerage Account (SDBA), exists in 401(k), 403(b) and 457 plans where participants will have access to professional management, stocks, bonds, mutual funds, and ETFs. Plans that offer the SDBA option provide the opportunity for employees to take full control of a portion of their current retirement account by linking it to the existing Core account. In doing so, participants expand the range of investment choices beyond the Core investments and will have access to the same management style as High Net worth Investors, Institutions and Foundations. The Core account refers to the retirement account through the employer that offers limited, pre-selected investment choices. 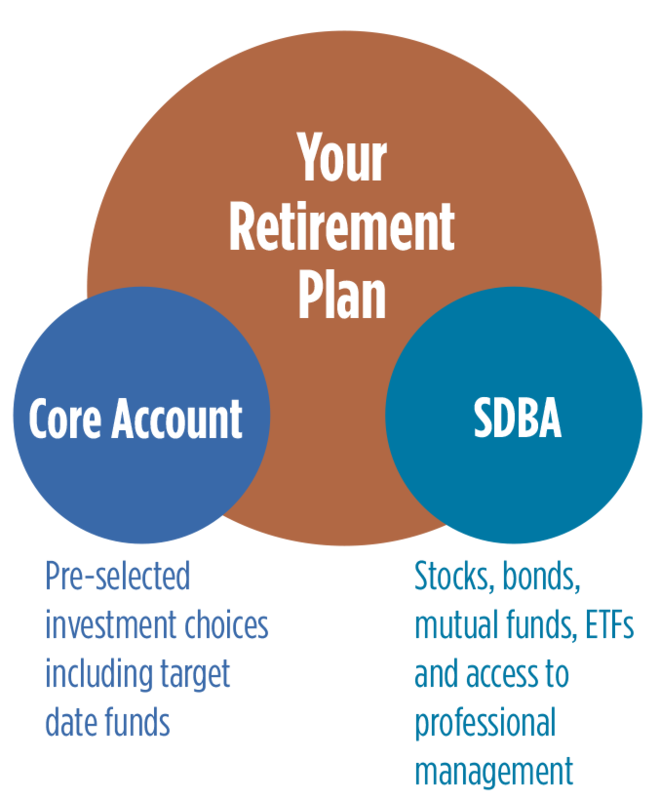 The SDBA is very similar to traditional brokerage accounts which exists as an eligible option on retirement plans. Employers that offer the SDBA option allow the employees to transfer a portion of their investments from the Core account to SDBA. Through this account employees have access to investment choices such as mutual funds, stocks, bonds and access to professional investment advice through a Registered Investment Advisor. SDBAs are currently the most underutilized investment options in 401(k), 403(b) and 457 accounts. However, this option should be used by investors who feel comfortable managing their own risk or are working with a professional Investment Advisor. The SDBA or a “brokerage window” is a choice on eligible plans that offers investment choices such as mutual funds, stocks, bonds, and access to fiduciary investment advice through a registered investment advisor. The source for The Plight of the Individual Investor is The Tyranny of Choice by N. Scott Pritchard, AIFA®, Capital Directions, LLC. †Dalbar’s 20th Annual Quantitative Analysis of Investor Behavior 2014: Average equity investor and average bond investor performance results are calculated using data supplied by the Investment company Institute. Investor returns are represented by the change in total mutual fund assets after excluding sales, redemptions and exchanges. This method of calculation captures realized and unrealized capital gains, dividends, interest, trading costs, sales charges, fees and any other costs. *The Standard & Poor’s 500 Index and the Barclays Aggregate Bond Index are unmanaged groups of securities considered to be representative of the stock market and bond market in general. Indexes are unmanaged and cannot be invested into directly. Past performance is no guarantee of future results. Recent studies emphasize the importance of client-advisor conversations. These reports prove that advisors can add 3% to clients’ net returns1 and retirement savers who sought investing advice enjoyed a median annual return almost 3% higher than those who didn’t – even after the fees they paid for that advice2. Financial advisors are not “one-size-fits-all.” They range from retirement plan specialists to broad based benefit advisors. Be sure to take the time to select the one that is right for you. Your retirement is a big investment – make sure you are getting the most out of it. Don’t let Wall Street determine your future. Take back control of your retirement. Contact Us Now! 1 -Source: 2015 401(k) Participant Survey conducted by Schwab Retirement Plan Services, Inc. Respondents participated in the study between May 26 and June 3, 2015. Investing in any securities involves a risk of loss. This piece was prepared by the Pacific Financial Group Inc. Investment Advisor Representatives (IARs) using this brochure are registered and offer securities and advisory services through their respectiveBroker/Dealers and/or Investment Advisory firms. Working with an investment advisor may accrue additional or higher fees, however performance is always stated net of all costs and fees. Other planning services offered through your investment advisor (such as college planning or financial planning) may also be available and may have an additional cost. Your funds are always invested in 100 percent liquid vehicles however purchases and sales may require a settlement period of 1 to 3 days.